The totally remodeled 2018 Toyota Camry is now here at Waite Toyota. Click here to find out more about the newest and most popular sedan on the market today. America’s best-selling sedan is now available at your Watertown Toyota dealer – Waite Toyota. Although it has been around for a while, it has been a decade since the Toyota Camry has received a complete makeover. Introducing the all-new 2018 Toyota Camry, which is anything but your everyday mom mobile. Available in five distinct trim levels, including the L, LE, SE, XSE, and XLE, the all-new Camry is more powerful than ever before. Fully loaded with a 2.5-liter four-cylinder engine, paired with a one of a kind eight-speed automatic transmission that even improves fuel economy, the ultimate in Toyota sedan’s is now capable of 203-HP and 184 lb.-ft. of torque. the optional 3.5-liter V6 engine also cranks out an amazing 301-HP. The latest in Camry models also has a bolder more eye-catching design than any previous model. The L, LE and XLE models are now sportier than ever with a more aggressive nose as well as a muscular side profile. The S and SE models make the Camry really stand out with more sporty styling cues that include large side intake vents, small rear spoiler, plus an option of two-tone paint that adds a black metallic color to the roof along with matching paint on the rear spoiler and the rear-view mirrors. The SE and XSE models also include 18” low profile wheels. Much like a high-profile sports car, the all-new Camry is built around the cockpit theme with instruments, dials and knobs angled at the driver to make it as easy as possible to see, touch and feel exactly what you are looking for. Materials have received a nice upgrade from the previous models making this sedan more competitive with other models. Both the L and LE trims have remarkably comfortable and easy to clean cloth seating, while upgrading to the XLE, XSE models offers leather seating. The all-new Camry also offers the latest Entune 3.0 system, which includes the Scout GPS Link through an app on your phone for navigation and comes with a free three-year trial, Entune App Suite, Siri Eyes Free, Google Voice Control along with voice recognition and Bluetooth audio. Other trim levels and options packages offer XM Radio, HD Radio, Gracenote album cover art, Safety Connect, Service Connect, Remote Connect and a built-in WiFi hotspot. Available with the upgraded JBL Audio system is a feature called Clari-Fi. Clari-Fi takes streaming audio from apps like Spotify, Pandora, Google Music and Apple Music and upconverts it to higher quality audio. What would a Toyota be if not safe? The 2018 Toyota Camry is one of the safest sedans on the market today. With an array of safety features, including 10 standard airbags and a rearview camera, this ultra-safe sedan also comes standard with Toyota Safety Sense technology, which includes traffic-adapting cruise control, automatic emergency braking in case of an imminent forward collision, lane departure warning and mitigation, and auto-dimming LED headlights. 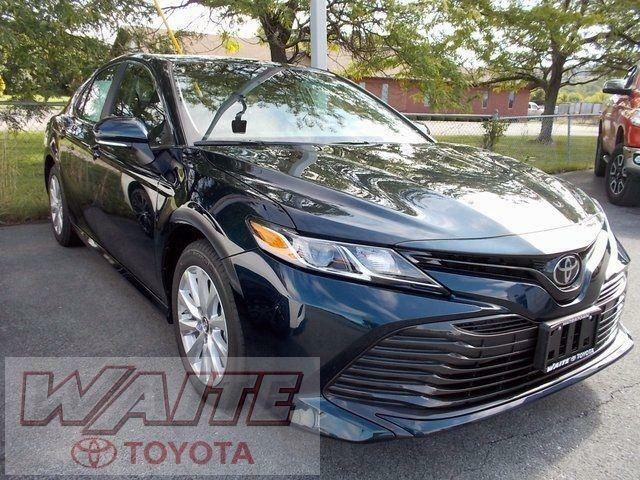 The 2018 Toyota Camry is now for sale in Watertown, NY. To find out more about Toyota’s latest award-winning sedan, schedule a test drive today.